Water Heater or Hot Water Tank, But NOT Hot Water Heater!! Let me get this off my chest right now, it is NOT a hot water heater! If the water is hot it doesn’t need heating and saying hot water heater is a double negative. If you call it this in the future I will commence to ask you why you have something which delivers cold water to the fixtures in your house! There, I feel better and you’ve been warned. I wanted to take this opportunity to do a two part series on said water heater. The first part which will begin shortly (or not depending on how slow you read) will give you a brief insight into some of the things that I look for when I come in to inspect your house. Don’t think with this info I divulge that you are going to go out and start inspecting water heaters but you will be able to look smart in front of friends and family. I just know that people sit around talking about the various home mechanical parts of the home just for fun, am I right……………….? OK, maybe it’s just me (or as my lovely wife would say, “It’s just you” as she rolled her eyes). The first thing I look at is the TP relief valve and tube. This is that pipe extending down the side of your tank, or should be. It is on the right side of the tank in the picture. Picture of water heater with TP relief tube on the right. TP stands for Temperature/Pressure. If your water heater keeps heating up and the sensor does not say, “OK dude, that’s hot enough!”, instead of exploding like a bomb in your home this valve will open and shoot hot water down onto the ground. Although it sounds like a real bummer to have hot water all over your basement floor, if that tube wasn’t there and your precious granddaughter Nicole was playing in the basement it could shoot scalding hot water all over and burn her (wink to Doris and the family!). That is the reason for the valve and the tube. This tube should extend to about 6″ above the ground. 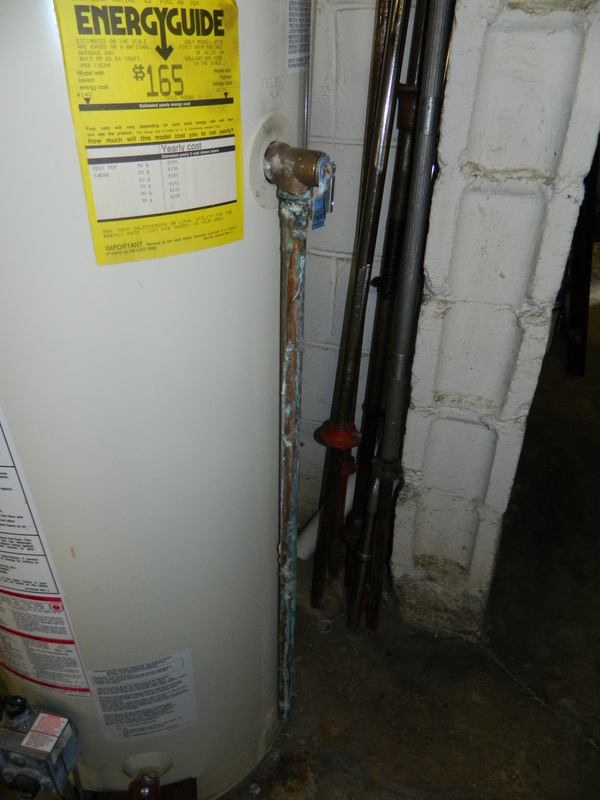 In an effort to not treat electric water heaters as second class citizens, I will only talk about one other thing I look for during my inspection which pertains to gas AND electric water heaters. In Ohio the gas water heater rules the roost. There is much more to look at and I sometimes forget about alternatives. There is also an on-demand water heater which is cooler than the other side of the pillow but it is a COMPLETELY different animal and would deserve its own post. Anyway, the next thing is the manufacturers sticker on the side of the tank. I get good info from the manufacturers sticker on the water heater whether it be electric or gas. The important facts I get for my report are the make (ie GE, Whirlpool, etc), how many gallons it holds and the age of the water heater. 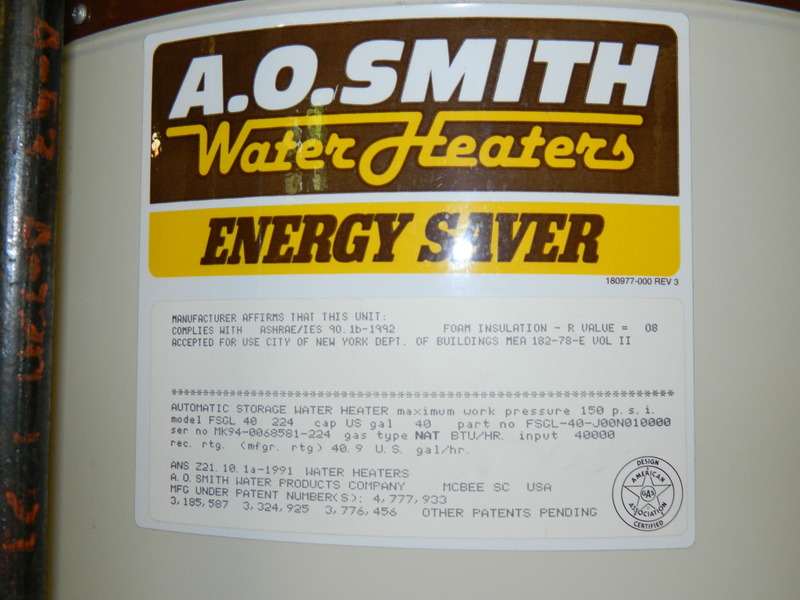 So from the label in the picture I determined that this is an AO Smith, holds 40 gallons of water hot and ready and was probably installed in 1994. It was at least made in ’94 and I will assume that plumbers don’t buy a stock of water heaters and store them for a couple a years before they need them. Determining the age is the cool party trick. It’s usually pretty easy once you get the hang of it, it is contained in the serial number. It might be hard to read in the picture but it says MK94-plus 10 other numbers with random dashes. The MK tells me it was November specifically (the letter K is the month). This one is easy and each manufacturer codes it differently. You can usually Google how to read it by manufacturer and find a site to help you. I know what you are wondering as you read this, “How old is too old?” or something to that effect. I would say the condition of the appliance is more important than the age for the most part. One quick rule of thumb I do use to advise buyers is tank size, yes size does sometimes matter. If you have an electric water heater the rule of thumb is to have at least a 50 gallon tank and for gas a 40 gallon. The gas heats the water quicker and if you have a few people taking showers in the morning you won’t likely have fights to go first. Electric, since it is slower to heat, needs a head start with the extra 10 gallons. If you have a gas water heater and you are wondering about the particular things I look for in that instance, just drop me a note. Until then I will just assume that my multitude of readers all have electric water heaters. The next post will be a video about periodic maintenance you can do to prolong the life and efficiency of your water heater. Hopefully you will be able to sleep with all the anticipation you will be experiencing!